For those who are in search of good recipes for cauliflower, do check this post. Whenever i get bored of having chicken recipes, i just run into cauliflower recipes. Cauliflower, one of the few vegetables which is liked by all age groups. Especially kids, they give more preference to this veggie when fried or roasted. Roasted cauliflower is my favorite recipe which pairs best with hot steamed rice. 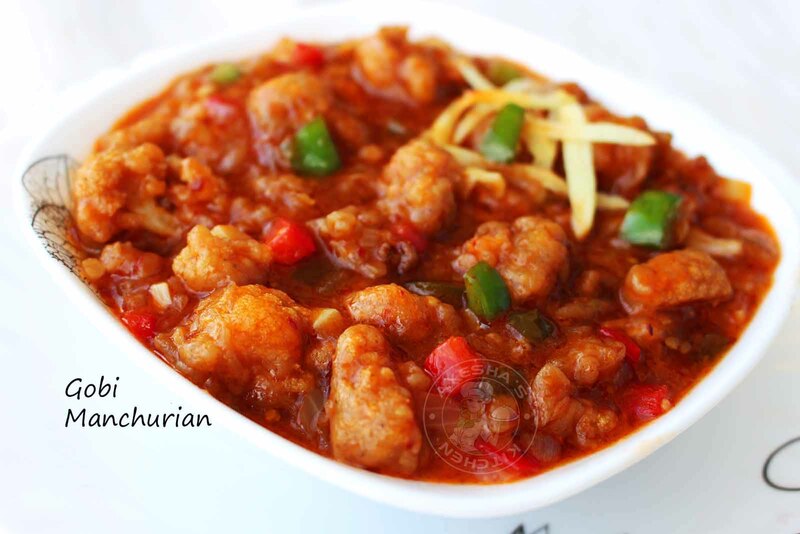 Cauliflower manchurian recipe, which is popularly known as Gobi manchurian is an Indo - Chinese recipe. An adaption of Chinese cooking and seasoning technique to suit Indian tastes. You can make gobi manchurian dry or gravy version. Most of the Chinese dishes calls for Ajinomoto, and like so restaurant version of gobi manchurian also includes this ingredient to enhance the taste. As i am not preferred in such unhealthy taste enhancer, i skipped that ingredient in my recipe. So for a cauliflower healthy recipes, do avoid food colors and taste enhancer. The spice level vary from mild to hot and fiery depending upon the personal preference only. This is the best cauliflower recipe along with Ghee rice or fried rice. 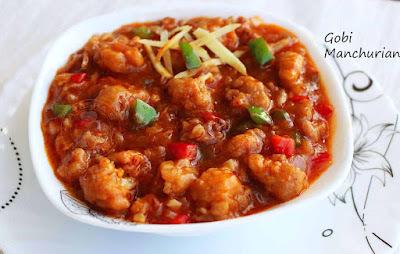 So here is the recipe showing how to make cauliflower manchurian recipe . Wash and add the cauliflower florets in a bowl. Drain it well. Set it aside. Combine together all the ingredients given under for marination with little water to make a thick paste. Do not make a watery batter. Add the drained florets to this thick batter and coat the cauliflower florets well with this batter. Always prefer less salt in batter for marination. Heat oil in a wok or non stick frying pan and fry this cauliflower florets until crisp. Better fry in batches. When done, drain to a paper towel and set aside. Meanwhile we can prepare the gravy. For that, heat oil in a non stick wok and saute garlic over a medium low flame. Then add spring onion and onion chopped. Saute for few minutes on high flame. Then add bell peppers chopped and saute for a minute. Reduce the flame. Now combine the ingredients give under ' for sauce ' in a bowl. Mix them well. Pour this sauce mixture to the sauteed onion gravy and mix well along with quarter cup of water (if you need a gravy consistency). Add salt and cook until the sauce thickens. Then add fried cauliflower florets to the sauce and combine well in the gravy. Mix well, half a teaspoon of cornflour in half a cup of water and pour this over the prepared gravy. Cook until it thickens. Finally add a teaspoon of tomato sauce and few bell peppers chopped . Mix gently and remove from flame. Garnish with ginger julienne or spring onion greens and serve hot. This dish tastes best when served hot only.